Are you happy with your service from Hometown Heating? Sign up today for our referral club and start saving! For every customer you refer you will receive 20 to 50 dollars off your next purchase depending on the cost of purchase made by the referred customer. The referred customer will also receive a 20 to 50 dollar credit to their purchase. The customer must be new to Hometown Heating and not already exist in our clientele. 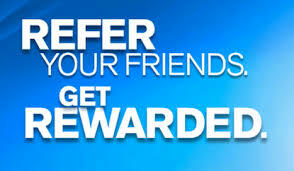 ​ Start saving now and fill out the form below to become an exclusive member of our referral club! Simply fill out your information and the name of the referred client. Also, have the referred customer let us know that you referred him/her when they make the call for their purchase. Once everything goes through we will contact you to let you know just how much you will save on your next purchase! Before you know it you could have your maintenance fees covered for the entire year! Save now and stay comfy with Hometown Heating! If you appreciate our service, tell your neighbours! Hometown Heating is always continuing to grow in order to keep you, your family, and your friends comfortable at home!